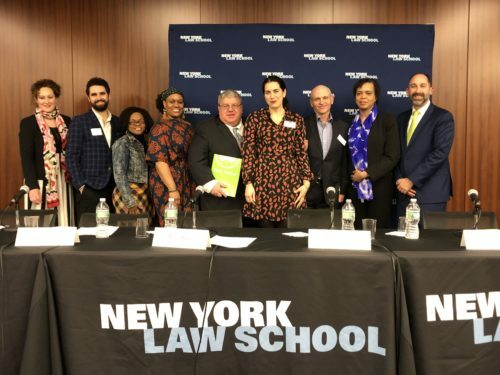 On January 9, 2019, New York Law School hosted our Open Space Dialogues: Healthy City, Active Places. Panelists included Sheila Barksdale-Gordon and Dionne Grayman, Co-Founders, We Run Brownsville; Joanna Frank, President and CEO, Center for Active Design; Martin Maher, Brooklyn Commissioner, NYC Parks; Michael Schnall, Vice President, Government Relations and Community Investment, New York Road Runner;, Mike Silverman, Director of Sports, City Parks Foundation; and Paulette Spencer, Community Engagement-Policy Analyst, Bronx Community Health Network, moderated by Jeff Coltin, Staff Reporter at City & State. If you missed the event, you can watch the full video on the CityLand website, New York Law School's Center for New York City Law's online publication.